Years ago I started writing Graphene as a small library of 3D transformation-related math types to be used by GTK (and possibly Clutter, even if that didn’t pan out until Georges started working on the Clutter fork inside Mutter). Graphene’s only requirement is a C99 compiler and a decent toolchain capable of either taking SSE builtins or support vectorization on appropriately aligned types. This means that, unless you decide to enable the GObject types for each Graphene type, Graphene doesn’t really need GLib types or API—except that’s a bit of a lie. As I wanted to test what I was doing, Graphene has an optional build time dependency on GLib for its test suite; the library itself may not use anything from GLib, but if you want to build and run the test suite then you need to have GLib installed. This build time dependency makes testing Graphene on Windows a lot more complicated than it ought to be. For instance, I need to install a ton of packages when using the MSYS2 toolchain on the CI instance on AppVeyor, which takes roughly 6 minutes each for the 32bit and the 64bit builds; and I can’t build the test suite at all when using MSVC, because then I’d have to download and build GLib as well—and just to access the GTest API, which I don’t even like. GTest is kind of problematic—outside of Google hijacking the name of the API for their own testing framework, which makes looking for it a pain. GTest is a lot more complicated than a small unit testing API needs to be, for starters; it was originally written to be used with a specific harness, gtester, in order to generate a very brief HTML report using gtester-report, including some timing information on each unit—except that gtester is now deprecated because the build system gunk to make it work was terrible to deal with. So, we pretty much told everyone to stop bothering, add a --tap argument when calling every test binary, and use the TAP harness in Autotools. Of course, this means that the testing framework now has a completely useless output format, and with it, a bunch of default behaviours driven by said useless output format, and we’re still deciding if we should break backward compatibility to ensure that the supported output format has a sane default behaviour. To solve the first problem we added a lot of wrappers around g_assert(), like g_assert_true() and g_assert_no_error(), that won’t be disabled depending on your build options and thus won’t break your test suite—and if your test suite is still using g_assert(), you’re strongly encouraged to port to the newer API. The second issue is still standing, and makes running GTest-based test suite under any harness a pain, but especially under a TAP harness, which requires listing the amount of tests you’ve run, or that you’re planning to run. The remaining issues of GTest are the convoluted way to add tests using a unique path; the bizarre pattern matching API for warnings and errors; the whole sub-process API that relaunches the test binary and calls a single test unit in order to allow it to assert safely and capture its output. It’s very much the GLib test suite, except when it tries to use non-GLib API internally, like the command line option parser, or its own logging primitives; it’s also sorely lacking in the GObject/GIO side of things, so you can’t use standard API to create a mock GObject type, or a mock GFile. If you want to contribute to GLib, then working on improving the GTest API would be a good investment of your time; since my project does not depend on GLib, though, I had the chance of starting with a clean slate. For the last couple of years I’ve been playing off and on with a small test framework API, mostly inspired by BDD frameworks like Mocha and Jasmine. Behaviour Driven Development is kind of a buzzword, like test driven development, but I particularly like the idea of describing a test suite in terms of specifications and expectations: you specify what a piece of code does, and you match results to your expectations. If only C11 got blocks from Clang, this would look a lot less clunkier. The value wrappers are also necessary, because C is only type safe as long as every type you have is an integer. Since we’re good C citizens, we should namespace the API, which requires naming this library—let’s call it µTest, in a fit of unoriginality. The colours go automatically away if you redirect the output to something that is not a TTY, so your logs won’t be messed up by escape sequences. I’m planning to add some additional output formatters, like JSON and XML. 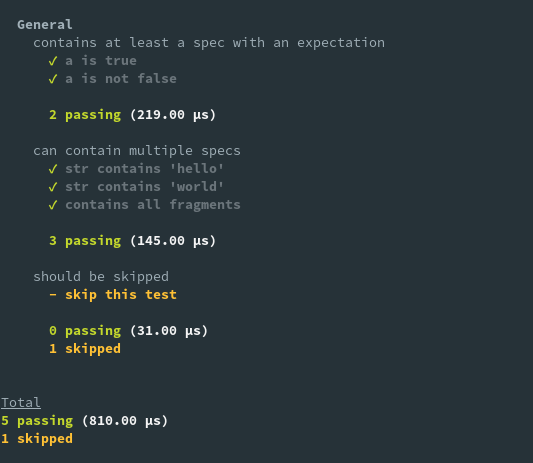 Then you can make the tests conditional on mutest_dep.found(). µTest is kind of experimental, and I’m still breaking its API in places, as a result of documenting it and trying it out, by porting the Graphene test suite to it. There’s still a bunch of API that I’d like to land, like custom matchers/formatters for complex data types, and a decent want to skip a specification or a whole suite; plus, as I said above, some additional formatted output. If you have feedback, feel free to open an issue—or a pull request wink wink nudge nudge.